Help us do it again! Bakersfield locals can now pick up a DVD of the Billy Mize doc at the Emporium Western Store. For fans of California country’s golden era, Billy Mize is an icon. A good-looking guy with a natural hosting ability, he transitioned from touring musician to TV personality with ease. But the story doesn’t end there. Actually, there’s a whole lot more to be said, which is the premise of a new documentary, Billy Mize and the Bakersfield Sound. The film will have its Southeastern premiere on Saturday afternoon (Dec. 6) at the Country Music Hall of Fame and Museum in Nashville. After giving up a steady gig playing steel guitar with his musical hero, Western swing bandleader Tommy Duncan, Mize chose to stay home with his wife, Martha, and their growing family. Instead of traveling relentlessly, he’d play seven nights a week in Bakersfield, just as the Bakersfield Sound was about to explode. Merle Haggard, Willie Nelson and Ray Price are among the musicians who attest to Mize’s influence in the film. In the 1950s and 1960s, Mize became a West Coast star by emceeing TV shows like Chuck Wagon Show, Cousin Herb Henson’s Trading Post and Gene Autry’s Melody Ranch. Along the way, he also penned a country classic, “Who Will Buy the Wine,” recorded by Haggard, Jerry Lee Lewis, Ernest Tubb, Charlie Walker and many more. After two unthinkable tragedies, the storybook ending unraveled, but Billy is still around to recount the story — even though a late-career stroke nearly stole his voice. The final scene, though simply shot, is quite astonishing when you consider all the circumstances. Joe Saunders, the film’s director and producer (and Mize’s grandson), answered a few questions by email. CMT Edge: When did you start working on the film? And what sort of preparation did you do before the first day of filming? Saunders: I shot the first interview (Martha’s solo) in 2009 and worked on it when I could between projects and life’s other priorities. This entire film evolved over the years. I had spoken with several of Billy’s friends over the phone before the first interview and had a general idea of what happened in Bakersfield. But there were still many surprises, both in Billy’s personal life and his career, that I would discover in subsequent interviews. Can you share some of those examples? Sure thing. I didn’t know that Elvis was a fan of Billy’s or that he borrowed Billy’s style. I also didn’t know Billy used to be an actor. He has all these headshots as different ‘professions’ — doctor, bad guy, office worker, etc. I touch on this a little bit in the documentary, but I didn’t realize it was such a viable option for him. I also didn’t realize that once you’re a performer, you’re always a performer. I’ve been a documentary filmmaker for over a decade now, and I’m used to directing nonactors. Billy and I were doing a publicity shoot in front of the yellow “Bakersfield” arc outside the Crystal Palace, and I asked Billy to turn to the arc and turn back to the camera. He nailed it with that smooth charisma that awarded him so many TV hosting gigs. I was floored, then remembered he’s been doing that his whole life. He’s a pro. There are a lot of scenes from Billy’s TV shows, and those were some of my favorite parts of the film. What was on your mind when you were looking at the vintage footage? It’s hard to pinpoint one feeling when watching that old footage. I felt sad at first. To see what a great talent Billy was — and to know that age and health conspired to take his voice — it’s so tragic. You feel bad for him. But he looks like he’s having so much fun singing and performing that you also feel proud and happy he was able to do what he loved — even if he would lose that ability. What do you remember most about the day you showed the final film to the whole family? During the sequence of Billy Jr., my aunt Marji turned to her son Kyle and said, “I never realized how much you looked like my brother.” He truly is a spitting image of Billy Jr. It became very emotional for everyone. “Billy Mize and the Bakersfield Sound,” a long documentary, took Best in Show on Sunday in the second annual Outside the Box Bakersfield Film Festival. The temptation to liken the life of Billy Mize to one of the melancholy country songs he wrote is a potent one — except that no one would ever write anything so damned sad. Unthinkable family tragedies, one after another, medical setbacks and a stroke that prematurely ended his career offer a pretty compelling case that Mize just may be the biblical Job of country music. The film had its world premiere in Los Angeles, but “Billy Mize and the Bakersfield Sound” finally comes home on Sept. 18, to a venue that doesn’t get more Bakersfield Sound-ified: Buck Owens’ Crystal Palace. 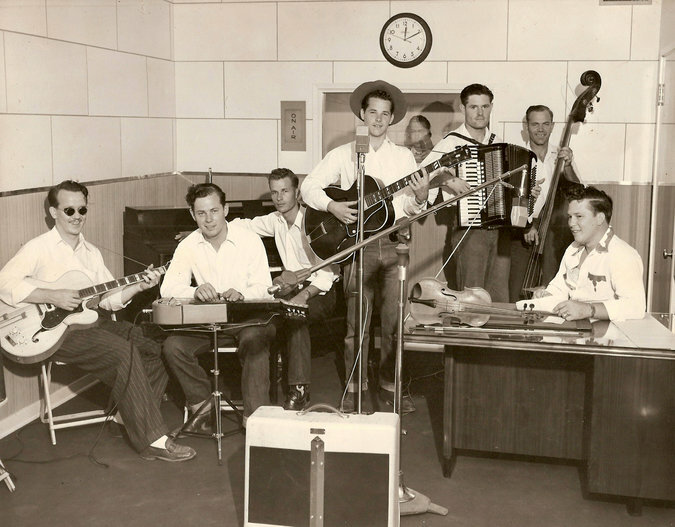 “Now it’s finally going to be played for the people who helped make it,” said filmmaker Joe Saunders, the grandson of Mize, a country music performer and television personality who, decades ago, joined Owens, Merle Haggard and their contemporaries in creating a raw and thoroughly original hybrid of rockabilly and honky-tonk that made the city famous. “I met my grandfather as an adult — not literally — but I’ve learned so much more about him as an adult and have a deeper understanding and respect for him,” said Saunders, 35, a Los Angeles filmmaker. The festivities kick off at 6 p.m. with, naturally, a little Bakersfield Sound music, courtesy of Tommy Hays and other local trailblazers of the 1950s and ’60s. The screening follows, at around 7 or 7:30. A filmmaker profiles his grandfather, one of country music’s leading lights of the ’50s and ’60s, and the influential Central California honky-tonk scene that he helped to build. LOS ANGELES — Even the vinyl addicts among us have to dig deep for Billy Mize. Scratching past Wynn Stewart’s “It’s a Beautiful Day” and the Jean Shepard and Buck Owens albums, I still couldn’t find a copy of Mize master sessions like “Please Don’t Let the Blues Make You Bad,” from Columbia Records in 1965. But there he was, sure enough, with the writer’s credit for “Who’ll Buy the Wine,” on Merle Haggard’s “Pride in What I Am” album. We’ve partnered with Tugg.com, a web-platform that enables individuals, groups, and organizations to set up personalized screenings of Billy Mize and The Bakersfield Sound in theaters and community venues across the country. Events can be used as fundraisers and can include audience discussions.